Although many green investors prefer to keep most or all of their capital close to home, they may pay a high price due to lower diversification and missed opportunity. Diversifying within the domestic market of large US companies is simply not enough for green investors looking to maximize returns over the long term. Consider the history. Since 1970, the S&P 500 (index of largest US companies) did better than the globally diversified strategy in only 18 years and did worse in 29 years. 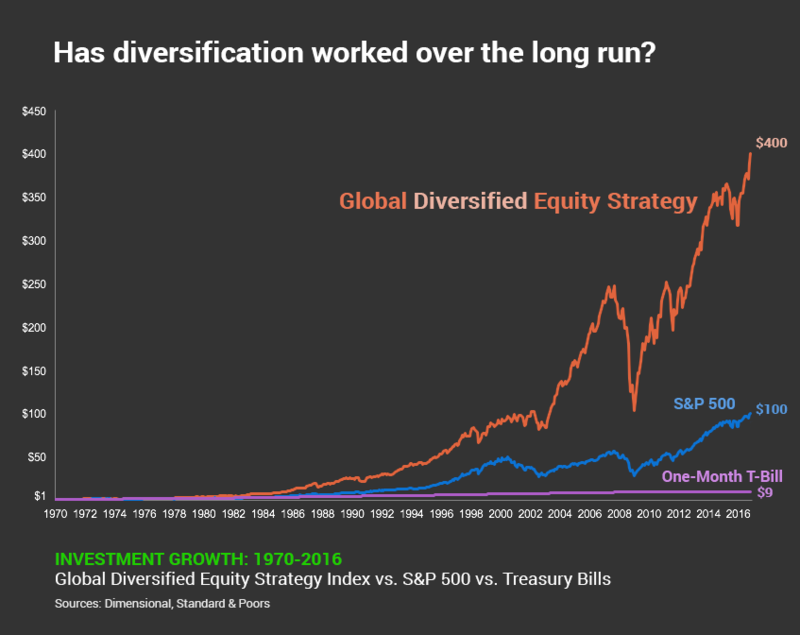 Overall, the globally diversified strategy delivered four times the return of the S&P 500. Chart in US dollars. Sources: Dimensional for Global Diversified Equity Balanced Strategy Index data. S&P data provided by Standard & Poor’s Index Services Group. Indices are not available for direct investment and performance does not reflect expenses of an actual portfolio. Past performance is not a guarantee of future results. Diversification does not eliminate the risk of market loss. One dollar invested in just large US companies (S&P 500 Index) in 1970 would have been worth $100 on New Year’s Eve 2016. A very nice return, which could have been much better. The same investment in the Global Diversified Equity Strategy Index would have been worth $400. Diversification is about the closest thing to a free lunch in capital markets, so you may as well get a huge helping of it. And, in these troubled times – where political risk and its financial impacts is a serious concern even in the US – a broadly diversified approach is likely to lead to greater peace of mind as well as higher expected returns. Should I Bet on President Trump or French President Macron? Perhaps Europe will bounce back economically with a new generation of leaders who believe not only that climate change is real, but also that economic growth and sustainability can prosper together. Should this inform our decision to own US or International stocks? Our emotions might say “sell US, buy France,” but that wouldn’t be financially prudent. While the performance of different countries and asset classes will vary over time, there is no reliable evidence that financial performance can be predicted in advance. What we do know is that they may perform quite differently over shorter cycles; over long periods of time, investors can benefit from consistent exposure in their portfolios to both US and non‑US equities. Here’s an example of how betting on specific nations is risky. Among developed markets, Denmark was number one in US dollar terms in 2015 with a return of more than 23% – and an admirable number one ranking on Readiness for Climate Change. But a big bet on that country the following year would have backfired, as Denmark slid to bottom of the pack with a loss of nearly 16%. It’s true that the US stock market (by far the world’s biggest) has been a strong performer in recent years. (Over the past five years, sustainable Denmark outperformed the S&P 500 despite its 2016 downturn.) But a decade before, in 2004 and 2006, the US was the second worst-performing developed market in the world. Predicting which part of a market will do best over a given period is not only tough, but risky. US small cap stocks were among the top performers in 2016 with a return of more than 21%. A year before, their results looked relatively disappointing with a loss of more than 4%. International small cap stocks had their turn in the sun in 2015, topping the performance tables with a return of just below 6%. But the year before that, they were the second worst with a loss of 5%. So what should investors do? Diversify globally, spreading your portfolio across different securities, sectors, and countries. That also means identifying the right mix of investments (e.g., stocks, bonds, real estate) that aligns with your risk tolerance. How Do I Diversify “Fossil Free”? Until recently, global diversification and sustainable investing were very difficult to do simultaneously. Not anymore. Now you can diversify globally “Fossil Free” or “Low Carbon” — and at low cost. To explore your options, check out DivestInvest Guide’s Find a Fund Tool and select the “Broadly Diversified” filter to see which sustainable funds leverage broad diversification to capture the “free lunch” that Professor French describes above. To take advantage of this special low minimum offer, enter “SODII2017” under “Special instructions” when you complete signup. This will allow us to open your account of $10,000 or more. (The standard minimum is $50,000.) Annual fee for a $10K account is only $100. OFFER EXPIRES 12/31/17. 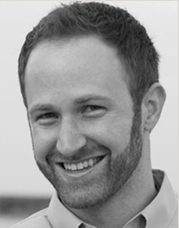 Mark holds a BA from University of California, Berkeley, MA in communication research from University of Minnesota, NASD Series 65 certification, and is a graduate of Stanford’s Executive Program in Financial Management. Mark currently serves as a Chair of the External Advisory Board of the University of Minnesota’s Institute on the Environment, one of the leading climate science research centers, and as a member of the Dimensional Sustainability Funds Council. From 2009 through 2015, Mark also served as Managing Director of Vision Prize®, a research partnership that captures scientific meta-knowledge on climate risks and solutions, in collaboration with IOP Publishing and researchers at Carnegie Mellon University. Peter received his Ph.D. and M.S. in Behavioral Decision Research from Carnegie Mellon University and B.A. in Mathematics from Swarthmore College. 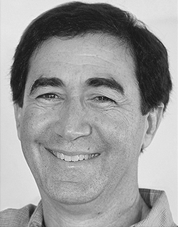 From 2009 through 2015, Peter also served as Director of Research of Vision Prize®. Macroclimate® (macroclimate.com) is an automated investment service – “digital advisor” – that limits exposure to climate risk. The firm has over $100 million of assets under management, and has been a Dimensional-approved investment advisor since 2004. As an SEC-registered fiduciary fee-only advisor, Macroclimate® never earns commissions based on where it invests clients’ assets. Macroclimate® is a Certified B Corporation, and donates 5% or more its annual revenue to environmental research and climate action.